1. Create goal(s) using the Lessonface goal-setting widget -- sign into Lessonface, then go to the green left-hand menu, and choose "Goals" under "Profile." 2. Post a comment or topic on the Lessonface forum. To enter our giveaway, take one OR both of these two actions by January 31, midnight EST. We will choose THREE winners at random from goal-setters and forum-users, who will win $250 apiece in Lessonface credits. No purchase necessary. Void where prohibited. Do you have musical goals for 2019? I suggest you share them with someone who will help hold you accountable. A teacher would be great for that! 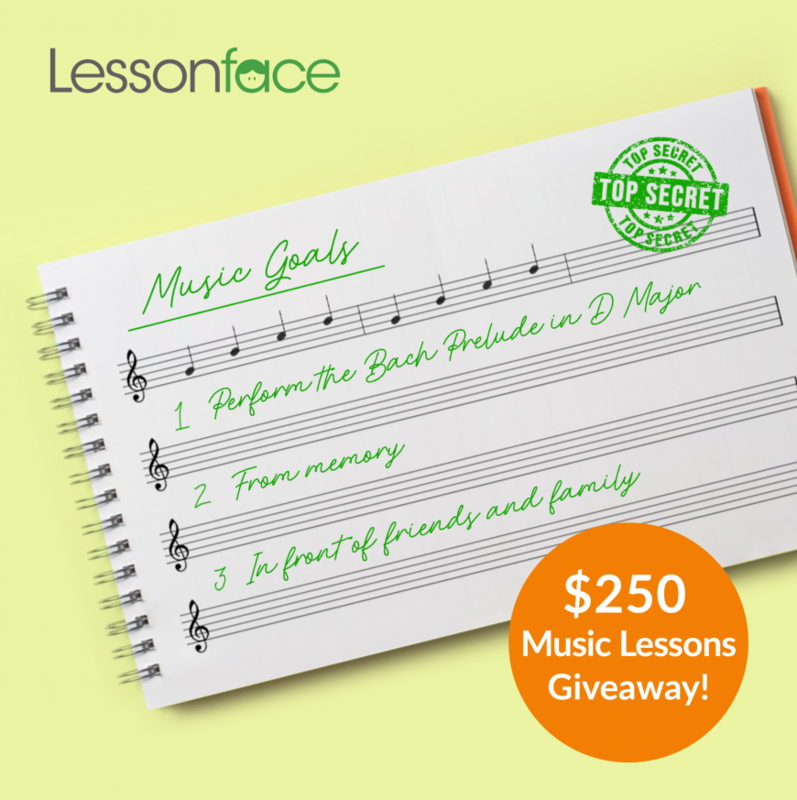 Lessonface is doing a giveaway to encourage people to set goals! The details are to the right. I started to write this piece thinking we'd ask people to publicly post about their New Year's goals on our newly revived forum, as I learned in a psychology class in the late oughts that publicly announcing goals increases a person's commitment and therefore success at achieving them. However, when I went to find some supporting articles to make this case, I was surprised to find that the research on this topic has shifted in these days of social media. In more recent experiments, researchers have found that publicly posting about one's goals makes a person LESS likely to achieve them. The reason is believed to be that the person who publicly posts gets the feeling of accomplishment from posting about the goal -- and possibly the congratulations and encouragement of well-wishers -- and then becomes less motivated to actually do the hard part, the work, to achieve the goal. Therefore, the prevailing advice these days is still to set goals, for sure, but don't share them widely until after you achieve them. So, rather than posting about your goals on the forum, it seems we should all keep our goals to ourselves (with the possible exception of a coach/advisor/tutor/teacher who will help you achieve the goals). You can easily set goals here on Lessonface with our goal-setting tool. Then you can keep your goals to yourself or easily share with a teacher or teachers who can help with your goals. To access the goal setting tool, make sure you're signed in, then look in the green left-hand menu under My Profile and you'll see Goals. To encourage you to set goals, and then be successful at them, we at Lessonface have created a giveaway for these final days of January! We will randomly choose THREE Lessonface registered users to receive $250 in Lessonface credits, which can be used with any lessons or classes on Lessonface. We will notify entrants of the winners on February 1 by the email address you have registered on your account. No purchase is necessary. Void where prohibited. If the entrant is a child, we will notify the parent of the win. 1. Create one or more goals on Lessonface using the goal-setting tool. Again, to find the goal-setting tool, register or sign in to Lessonface, and go to the green left-side menu. You'll find Goals under "My Profile." Set a goal or multiple goals by January 31 and we will enter you in the giveaway. 2. Post on the forum! Because we would also like to hear from you on our forum, we will also enter commenters on the forum who post by the end of the month into the giveaway! Leah Kruszewski has some excellent comments on how to set achieveable goals in a forum post here, and there are other discussions about how to choose your instrument, gear, barre chords, and a whole lot more. Take a look and join in our discussion. Post a comment or new topic before January 31, 2019 and we will enter you in the giveaway. What has worked for you in setting goals in the past? Do you feel that sharing goals with friends and familiy when you set them is helpful or do you usually wait til after, perhaps by wowing them with a beautiful performance? In related news, we're going to have recitals organized by Lessonface in May this year! Please talk to your teacher about whether you would like to participate. We'll be asking for sign ups in February. The goal listed in the goal-setting image is an example from Leah Kruszewki's forum post about effective goal-setting, which is highly recommended! The graphic above with the bullseye and sunglasses images are from wikimedia. The bullseye photo is by Santeri Viinamäki.